" There's an argument to be made that the attacks actually, in a way supported the firm"
Watch and listen to the segment between 3:42 and 4:07. Woman in red: - "I'm good"
TV anchor colleague: - "You're good?" Woman in red: - "Yeah, it's a great interview - it's so great to have you on (inaudible) and to...uh...see the firm has survived all this time and it's...ehm...(inaudible). Can a native English speaker please fill in the (to me) inaudible spaces? Thanks! It's an interesting exchange, Simon. He looks most uncomfortable - is it because he is mentioning no other "terrorist" attacks have taken place or other false flags? She certainly seems to be making the "cut it" sign of pulling the hand across your neck. Anyway, to fill in the blanks.......... she says "great to have you on the set". The other part is indecipherable, even to an "English speaker" , but she seems to say something like "It's a little tear (muffled)"
"set" and "teary ache" respectively (although I rather think the latter phrase is of american origin). "I feel a little teary-eyed" is what the byatch says. Yeah she said "teary-eyed" although it is hardly understandable why a pro who feels emotional should attract attention to herself. But maybe she was not waving at Lutnick. She was waving to her own face like chicks do when they cry, and scumbag Lutnick couldn't resist the ungentlemanly chance to put her on the spot to profit from her emotional state and look good because she cried to his lies. What I see is that this small-time crook Lutnick is very much comfortable with his lies today. He wasn't so comfortable right after 9/11, and we have seen interviews where his acting was exaggerated and clumsy because he felt he had to convince people. Now there's nobody that would but be in awe of him and his stories, I think this is how he feels. I'm still not convinced he is a real CEO of a real company. He is walking reminder of 9/11, this seems to be what he really does. Like Uchitel & co.
@SmokingGunII: can you elaborate on your first-hand knowledge of Cantor being a real company? I know that Cantor has obviously a presence in the real world, offices and paperwork and all that. But it could easily be a hollow container for other activities or for no activity at all. We can speculate that it might be fake, in the sense that it might not be what it pretends to be. And maybe its birth does not date back to the forties, maybe it was created in the 80s or 90s, together with al-quaeda and the silverstein group and whatnot. Why mixing real business with the scam, when everything can be hidden behind a network of simulated companies? Once again: it is remarkable that in the 90s this company was apparently involved in software simulation of financial activities. 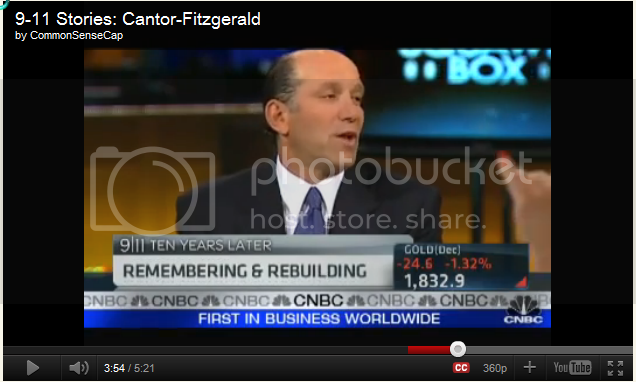 If you go on the cantor website, so many links seem to bump you to BGC, that maybe handles the real business. No. I think she was making some sort of motion that indicated he should stop talking about bombings and other events like London and Madrid, which has as many people doubtful of what took place there. Because Joe Kernan asks her, Michele Cabruso Cabrerra,"What were you going to say?" He incredulously asks, "You're GOOD?!" He does this, because I am sure he saw part of her hand motion picked up on their feedback tvs. To make it seem like she just was like raising her hand or something to interject or make a comment. She is filling in for Warren Buffet's sweetheart, Becky Quick who is out on maternity leave. They have had a recent shake up and are not used to working together particularly with the new guy Adam Sorkin I think is his name who bumblingly starts the interview. 1980 could well have been the year he returned as an 'old boy'. Below is a photo of him "throwing the Cricket Ball" at St Pauls in 1976. Sports day at Bellingham circa 1976. An event aptly named "throwing the cricket ball" was usually won by Robert Eaton (shown throwing) or Craig McLeish (far right). Andy Williams is centre left. Who are the others? Eaton's background appears to draw a blank between leaving 6th form college in 1983 & working for Cantor. Alex Clarke lives with her husband John near Richmond Park in South West London. They have been married for 34 years and had 3 children. Alex has a nursing background although she is not currently practicing. She is Chairman of a Governors committee at a local school. 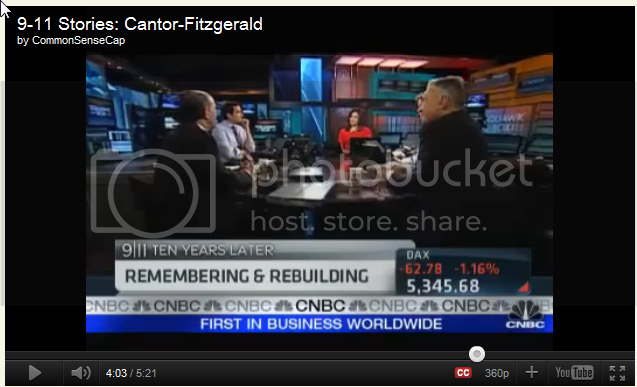 Cantor-Fitzgerald. They also have two sons, the eldest Tom Clarke, is the Support Group press officer. Jack, the youngest, is still at university. Alex is a passionate gardener. Last edited by antipodean on Thu Sep 29, 2011 6:05 am, edited 3 times in total. Maybe it's the way the camera pans out, but the woman in red looks to be sitting to far away from Lutnik for it to be her hand. Antipodean, I think the camera that is taking the face shots of Lutnick can be seen on the lower freeze frame at the top of the shoulder of the guy in the foreground. If you zoom it at 200% you can make out his image on the screen. That camera is located between the woman in red and the man (Kernan) who questions her if she had something to say, because the movement would have been with her left hand making cut-throat move, in his direction. Kernan's face can barely be seen in the bottom freeze. In short, yes, it's the camera angle for close-ups of Lutnick. At least, that is how it appears set up to me. Yeah ! I'm with you now, the camera goes to a close up of Lutnick & up pops her finger/ hand to motion to Lutnick to stay on topic.Then Kernan has to turn to her so as to make her gesticulation look as though she wanted to say some thing, which is why she struggles to say something that is relevant. I started to dig into that group a few years ago, Antipodean. A search for "Alexander Clarke school governor" still draws a blank (except there is a male of the same name). There is no trace of her or her husband when searched for in London. This means they are not on the UK census, which is illegal. Tom, her son, allegedly works for Channel 4 and worked for ABC in NY prior to 9/11. I've said before that there is something fishy about that organisation, but I just don't get the time to dig deeper. Nonho - In answer to your question, I know people that dealt with this company through commodity trading etc. I can't say whether they had offices in WTC as the people in question never had cause to go to NY. I've just revisited Robert Eaton's legacy obituaries and came across this interesting entry. All our thoughts once more, on this sad anniversary, are with you. Yesterday the Robert Eaton memorial flag was with us, at Watford for the match, and the Albion performed for you Robert, a battling 1-1 draw. Not a day goes by without thought - my escape from 63 WTC 1, and your loss, so close, but so far. God bless. So this Paul Neal guy escapes from the 63rd floor of WTC1. I wonder if Robert knew that on one of the floors below where he worked, was another follower of his football team from the same town as him. Then I revisited the football forum where Robert was a keen poster, & placed Paul Neal's name in their search engine. Here is one of many posts featuring Paul Neal's name. Surprise, surprise he's heavily involved in the Robert Eaton Memorial Fund. Robert, whose wife Jacqui was American, was a huge Brighton and Hove Albion fan and followed the fortunes of his team on the club's web site North Stand Chat. After his death, two fellow fans, Steve McMahon and Paul Neal, set up a memorial fund in his name. Interesting finds... if one could obtain a current listing of employee names (or any company that had roughly 360 employees) one could do some comparative analysis, just to prove our point. Although, its safe to assume they are lying out their asses. I only just caught up with this topic, but I think Unleashed & antipodean described the dynamics of the on-camera hand gesture 'oops' & clumsy recovery perfectly. TV anchor: - "What were you gonna say?" TV anchor (colleague): - "You're good?" Woman in red: - "Yeah, it's a great interview - it's so great to have you on set and to...uh...see the firm has survived all this time and it's...ehm...makes me a little teary-eyed".